After he had experienced a long-haul flight in the business class for the first time, a friend told me he would never go back to the economy. The perks that come with a higher status of traveling easily get under one’s skin. And then: there is no way back! I was thinking about this when I recently checked in to the Crowne Plaza Vientiane, the best rated 5-star hotel in Laos capital. Staying in this first class establishment strongly resembled an elevated flying experience. The one reserved only for the luckiest among us. Especially with the Exclusive Club Package, which marked my three-day stay. Crowne Plaza Vientiane hotel was located in Chantabouly district of Vientiane, just 10-minute drive away from the Wattay International Airport. My Club package at this upscale hotel came with an included round-trip airport transfer. But even far from the plane engines, my experience of the Club benefits reminded me of the gains I usually got with my frequent flyer card at the airports. I was able to check-in (and check-out) through a private registration at the Executive Club Lounge. At the moment of my arrival, there was no big group checking-in at the Crown Plaza front desk. But I could see how Exclusive Club privilege would have saved my patience in such a situation. 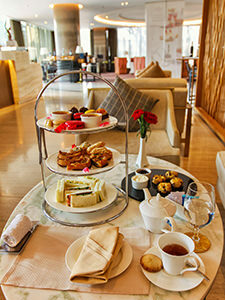 With these temptations, I could imagine staying in Executive Club Lounge the whole day! I also got free access to Crowne Plaza Vientiane Club Lounge, which had the atmosphere of a well-maintained airport lounge. Canapé sandwiches, cake treats, coffee, tea and soft drinks were always available. In the evenings, the complimentary beverages included alcohol selection too. Also, the Executive Club Lounge was the place to have a free breakfast or dinner without the excessive crowding, a business meeting with one’s partners, or just a relaxed read of the daily newspapers. Priority check-in, lounge access, “inflight magazine”… This is the hotel with wings! My main objection to the otherwise pleasant lounge design was that it could improve the availability of power outlets for business travelers. While the area with armchairs had them, working at the desk was possible only if one charged laptop batteries beforehand. To round up the similarities with the airline business, Crowne Plaza hotel in Vientiane had its very own “inflight magazine”! The Edge – The Art of Staying on Top was a periodic hotel guide that informed the guests about the hotel activities and events, food and beverage offers, and other tips. 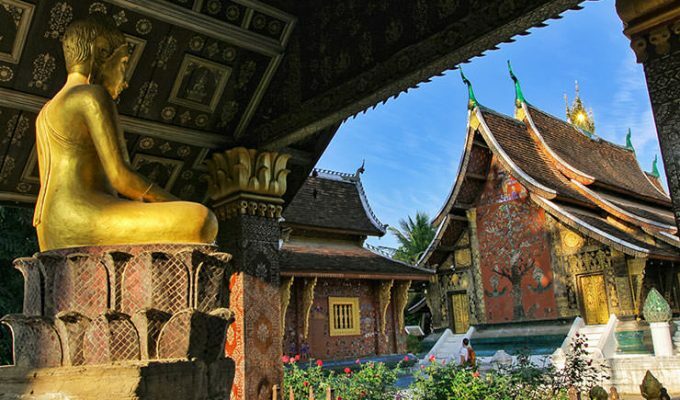 If you travel to Vientiane, why not extend your trip by visiting Luang Prabang, the former royal capital of Laos? “Welcome to Crowne Plaza Vientiane”, the personalized message greeted me over the 40-inch flat screen TV. The room did feel welcoming. With an open floor plan, and sliding doors revealing the bathroom, its 35 square meters felt spacious. Spacious enough to even do fitness or yoga here, in case I didn’t feel like heading down to the modern gym facility with a dedicated yoga room, treadmills, free weights, even a punching bag, all accessible 24/7. Multifunctional room – for working or relaxing, as you wish! The king size bed came with premium bedding and universal power outlets close by. For those who arrived in Vientiane for business, a small work station with an ergonomic office chair seemed very convenient. There was also a couch for daytime relaxation. The bathroom had a nice freestanding bathtub, a glass-walled booth with rainforest shower and a separate toilet room. 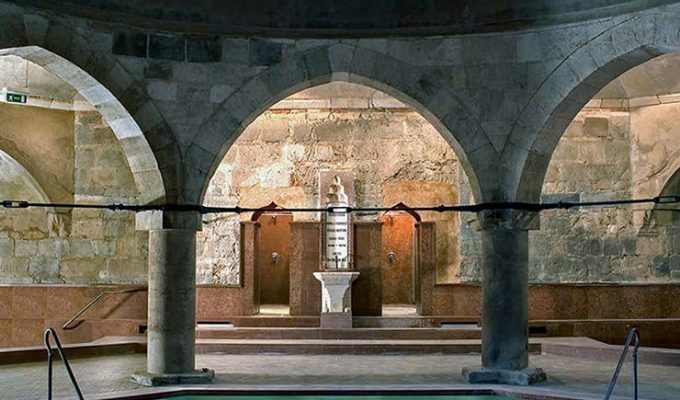 Dressed in large tiles made of ceramic and marble, space felt luxurious, but not intimidating. Hand soap came from Lao villages, handcrafted by local women under the label Soap4Life, which promoted handwashing in rural areas to save children’s lives. That was a great example of responsible business philosophy Crown Plaza Vientiane implemented in their everyday operation. I hope this type of partnerships could be even enlarged in future! Crown Plaza Hotel Vientiane had 190 guest rooms and eight suites. We could count Vientiane 5 star hotels practically on the fingers of a hand. So when IHG (InterContinental Hotels Group) brought this brand to Laos in 2017, Vientiane accommodation scene got a fierce competitor. 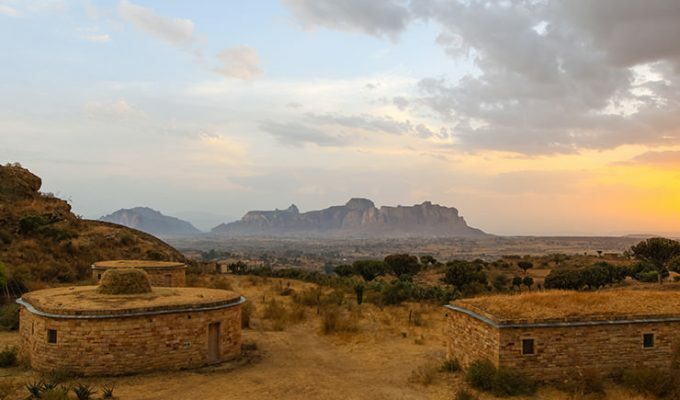 There was an unavoidable impact of the country’s development phase, one that hotel couldn’t do much about. Even if Crowne Plaza Vientiane built the state-of-the-art gym facility or spa with Jacuzzi, they were overlooking a wild urban development that didn’t improve the view. 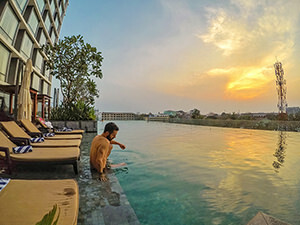 The best hotel in Vientiane made a beautiful infinity pool, but swimming at sunset looked much less romantic when a giant antenna tower across the road protruded the scenery like getting a punch in your face. Indeed, Crowne Plaza Vientiane was a bubble, miles ahead of its nearest surrounding! This disadvantage was a perfect challenge for courageous investors. Of course, all Crowne Plaza hotels and resorts adhere to the international standard one would expect from a brand. As much as the arrival of Crowne Plaza in Vientiane was changing Laos, it also worked the other way around. 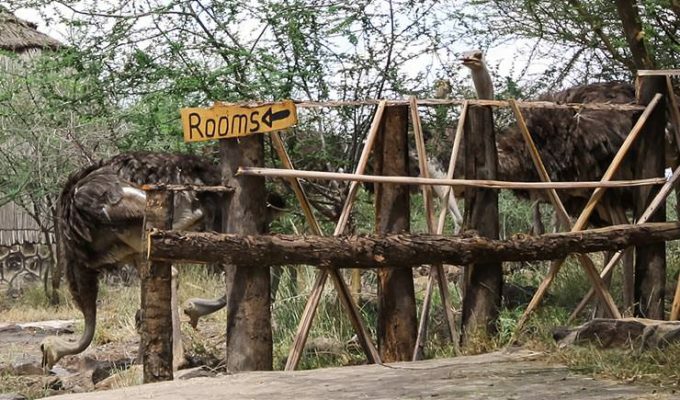 Local authenticity spilled into the hotel design in a subtle and non-aggressive way. The reception desk area, as well as the wooden decor throughout the hotel, brought in the patterns of diamonds and flowers. These are the traditional symbols vastly present in the country’s textile design heritage. By Lao beliefs, these were additionally charged with magical properties of blocking the negative spirits. However, they also functioned as a neutral aesthetical choice. 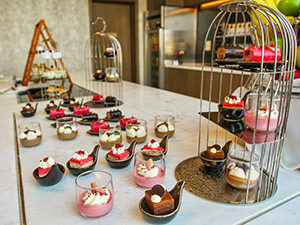 The afternoon tea set is composed of so many savory and sweet delicacies that it could be consumed until – the evening! Let’s move to Vientiane’s social hub, a place to enjoy the exquisite three-tiered afternoon tea set with your friends or partners. The Elephant Lounge on the ground floor was another example of how tradition could be tastefully reinterpreted. The bar area was dotted with elephant sculptures formed in abstract, origami-like geometry, recalling the historical reference of “The Land of a Million Elephants”. Yellow blots on the purple-grey carpets in rooms and corridors could’ve been just Rorschach’s psychological test, open to various interpretations. On the other hand, they were naturally blending into an environment filled with different yellow-golden accents. 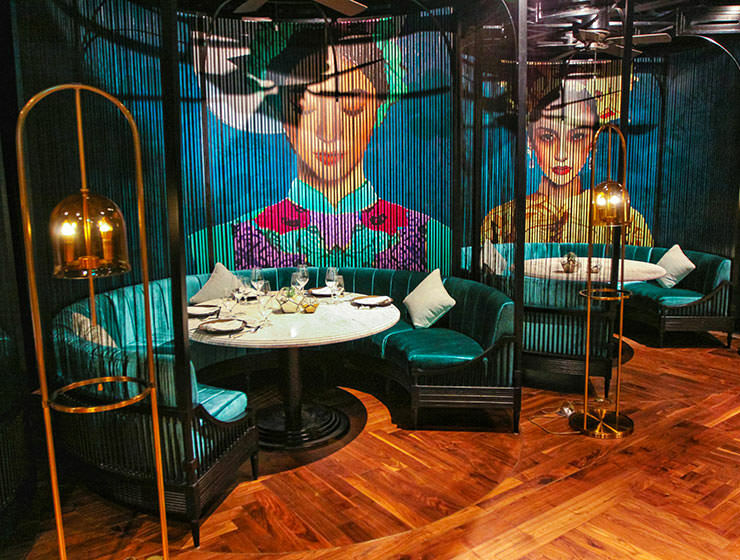 Whether hand-painting above the bed headboard or sculpting in front of the elevators, the artists brought the images of Mekong River into the elements of the interior design. Even the lampshades at Crowne Plaza Vientiane swimming pool were made of traditional wooden contraption devices used by Mekong fishermen to catch fish. That canvas above the bed should supposedly be an amulet against the evil dreams. If believing that the Mother Mekong would protect you while you slept was not enough, Crowne Plaza Vientiane hotel offered science-based solutions too. 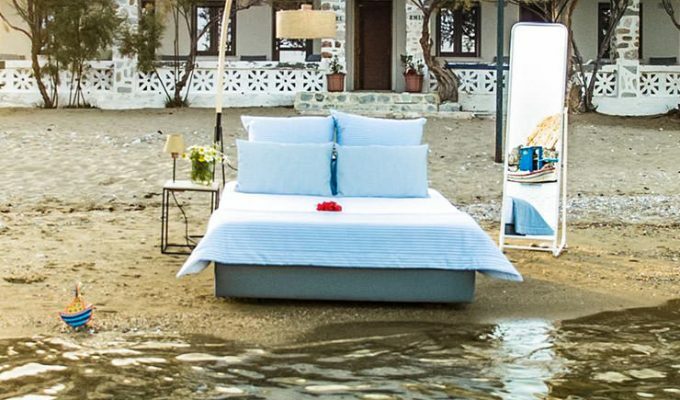 Those included the possibility of replacing your high-quality pillow with any of eight other types, or using the aromatherapy spray which should bring a good night’s sleep. For an additional level of tranquility, you could choose to stay in the quiet zone, on floors 9 or 10! Try not to fall asleep under the professional care of Crowne Plaza masseuse! 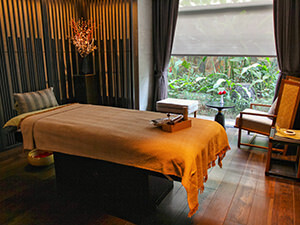 There was another way to ensure a night of good sleep: experiencing a massage at Crowne Plaza Vientiane’s Senses Spa. Masseuses here used Ytsara, a luxury spa brand from Thailand that blended Asian ingredients with French science. My Mohom Indigo Healing Art Signature Treatment lasted 90 minutes. It combined the warm Indigo herbal ball with a rare essential oil found only on two remote Pacific islands! Pampering at Senses Spa would’ve indeed been a perfect lullaby before calling it a night (thank you, madam Koi! ), if I wouldn’t have planned a dinner at 3 Merchants, probably the highlight of Crowne Plaza Vientiane’s exclusive offer. As I’ve already heard compliments for dining experiences here, I wanted to look nice(r). So I handed my shirts for pressing, which was complimentary due to my Exclusive Club Package. The shirts came back to my room in a couple of hours. I was ready to head down to the ground floor for dinner. The ambiance of the 3 Merchants immediately seduced me. Dark and mysterious, with chinaware and birdcages, with curtains that could be semitransparent or as thick as the ones in the theater, with grillages and passages. Giant female faces watching you or shutting their eyes on the paintings, blue velvet chairs and dark marble tables; it was all screaming elegance. This was promising an Experience! The food lived up to expectations, if not even surpassing them. If you visit Crowne Plaza Vientiane’s 3 Merchants, I strongly recommend choosing their Signature tasting menu. For 482.790 Kip (50 Euros), you could sample most of the dishes in the offer of Vientiane’s first authentic Indochina restaurant. Expect powerful flavors from the whole region – Malaysia, Vietnam, Laos, Thailand, and Cambodia! From delicious seared scallops with green mango salsa and peanut crunch, via the awakening spiciness of Tom Yum and coconut broth, to the delicate Calamansi sorbet or concrete Massaman braised lamb shank, eight courses were competing on my taste buds complementing each other. I enjoyed this culinary adventure for three hours! And mind you, I was alone, so just eating, with no conversation slowing me down! And yes, thanks for asking, there was still space for desserts in my stomach! The plate included burnt pineapple with coconut sorbet and sticky rice, the essence of mango, and charcoal cone filled with banana and sesame cream. It was a visually appealing treat of textures and flavors! 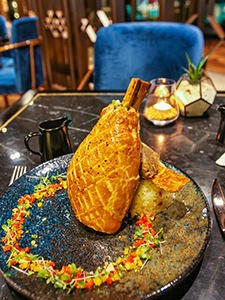 Besides 3 Merchants and already mentioned Executive Club Lounge (dinner there typically consisted of five options to choose from), Crowne Plaza hotel in Vientiane also offered Mosaic, an all-day dining restaurant. Its new dinner menu put an accent on international, mainly European food, from steaks to pizzas. 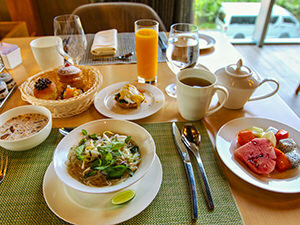 Make your own breakfast – combinations in Mosaic Restaurant are endless! However, I believe Mosaic was giving its best at serving breakfast. It felt like you were stepping into a local market, with so many tempting possibilities that the breakfast period between 5:30 and 11 am might not be sufficient! Crowne Plaza Vientiane breakfast was a spectacle of choices, served through live cooking stations, with local and international food. This buffet maze included the noodle station, salad station, grill station, cheese station, eggs station, fruit section, bakery products… And all of it was coming in a fantastic variety! One could easily get lost in the array of food options, but employees working for Crowne Plaza Vientiane were always there to help. After the first morning, the staff would already greet you at the entrance of the restaurant with “Good morning, Mr. Ivan!”. They would also remember that you had a peppermint tea yesterday, in case you wanted to order the same. For the hotel with hundreds of rooms, I found that quite impressive! With gourmet snacks and cocktails available at Splash, the casual pool-side bar, light bites that complemented premium beer selection at the Garden, romantic dinners under the stars in the secluded area, or even the in-room dining for those who wanted the ultimate privacy, Crowne Plaza hotel kept you from leaving the premises and exploring Vientiane’s gourmet scene. 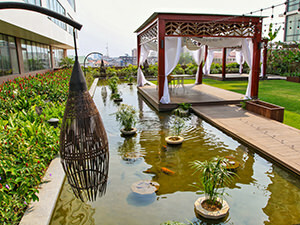 Troy Medinski, the hotel’s director of food and beverages, advocated for the environment that enabled creativity in every Crowne Plaza Vientiane menu. Well done! Laos is a country in development. Roads here may not be perfect. The quality of public service and public space may be inconsistent. People in the street may not always be able to speak English. 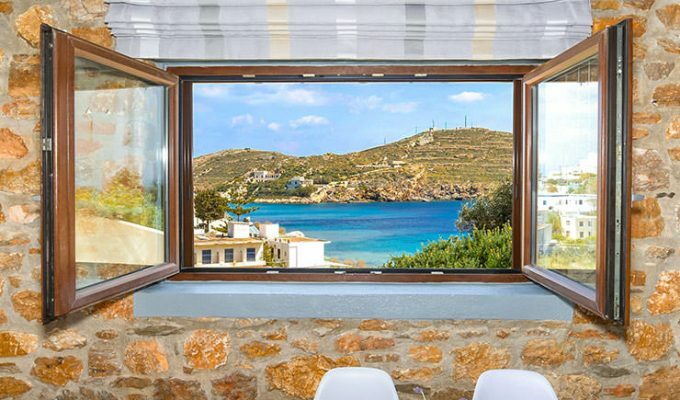 Views from your hotel room may not be mesmerizing. Traditional fishing gear reinvented as a – lampshade! The arrival of international brands such as Crowne Plaza can serve as an engine for further development of the local economy. Pioneering conquerors can sometimes be irrespective, but they can also come to multiply the country’s potential. 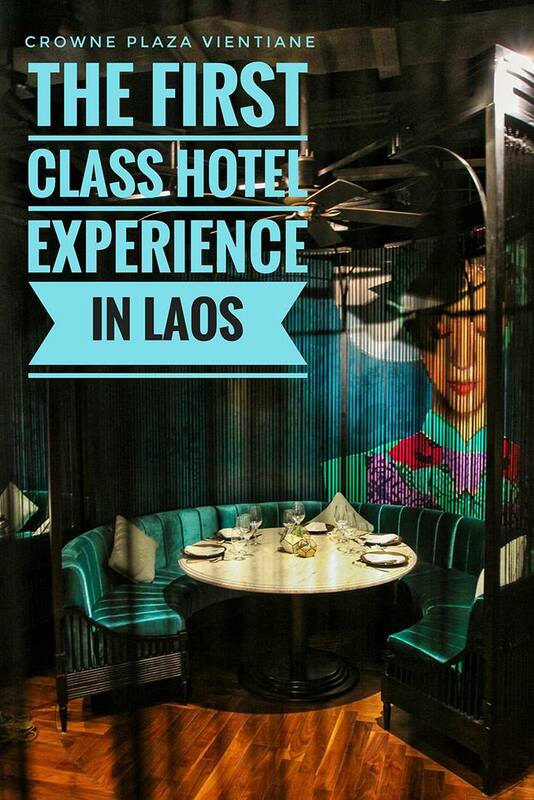 In Laos case, this hotel brand can definitely play on the cards of hospitality and heritage. 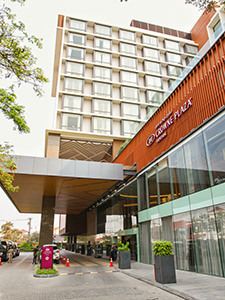 Crowne Plaza Vientiane excels in delivering local, national and regional values through design, food, and comfort. It secures first class value for both leisure and business travelers, especially those who want to be a part of the club, the one that brings benefits to its guests, but hopefully to the guests’ hosts too. I expect that in the coming years we will see the hotel grow even more and even deeper. Together with Vientiane. 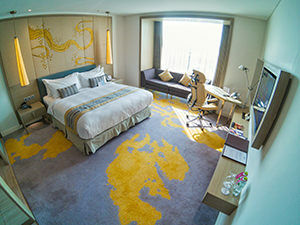 If you consider staying in Crowne Plaza Vientiane, look for the best discounts at booking.com. Disclosure: My stay at the Crowne Plaza Vientiane hotel was complimentary, but all opinions are my own. Also, this post contains affiliate links, which means if you click on them and make a purchase, Pipeaway may make a small commission, at no additional cost to you. Thank you for supporting our work! Laos hasn’t really been on my “bucket list” – but if I ever get there, I’ll definitely check out the Crowne Plaza Vientinane for my lodging! The room looks really big relative to most Asian hotels in which I’ve stayed, and the food looks amazing! What an outstanding place. Thanks for your comment, Jim! Definitely give Laos a chance! It is an amazing country if you are willing to dig under the surface. Then there are always safe bets/nests, such as this one! For me, the room is just the right size! And then, if you enjoyed the food already through the pictures and description, I’m sure you’d love it through the taste too!